Lottie and Lil Blog » Shopping, the Ultimate Pastime! If you ask most 13 year old girls what their favorite pastime is, shopping would definitely be high on their list. Ariana, the birthday girl, is no different! 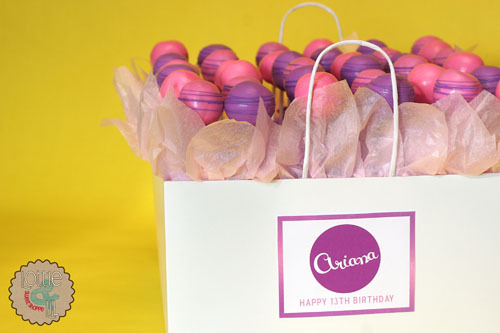 A custom cake pop display was made to look like a shopping bag with a birthday tag to match the logo from her favorite store. 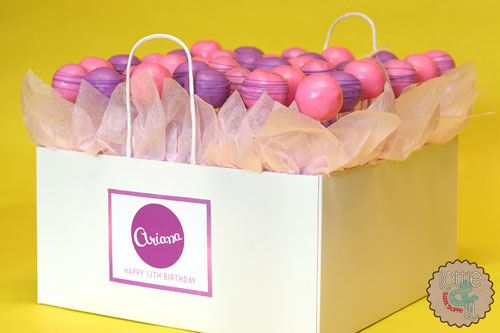 With pink and purple being her favorite colors, these girly cake pops were the crowning touch to her birthday celebrations. This entry was posted on Monday, September 10th, 2012 at 7:50 am	and is filed under Birthday Pops.